Typically, when I buy a pair of workout leggings, I only wear them to work out. I personally find some pairs of workout leggings are not comfortable enough to wear for anything else. However, this pair is an exception. They have this fun jaguar print on the front, but look like a pair of plain navy leggings from the back. They have a high waist fit, and they are SO comfortable! They are more of a cotton material, so for workouts I like to wear them more to a barre class or something that I do not sweat very much. They would not be my first choice for a hot yoga or HIIT class, but I have been wearing them a lot to run errands and hang out around my apartment. Also, you may have seen these sneakers in gray in some past posts, and now I also have the navy pair! I love everything about this outfit! Especially the monogram sweater! Thanks for sharing! Love these leggings on you, Cara! Too cute! Loving this outfit! The leggings are so cute! 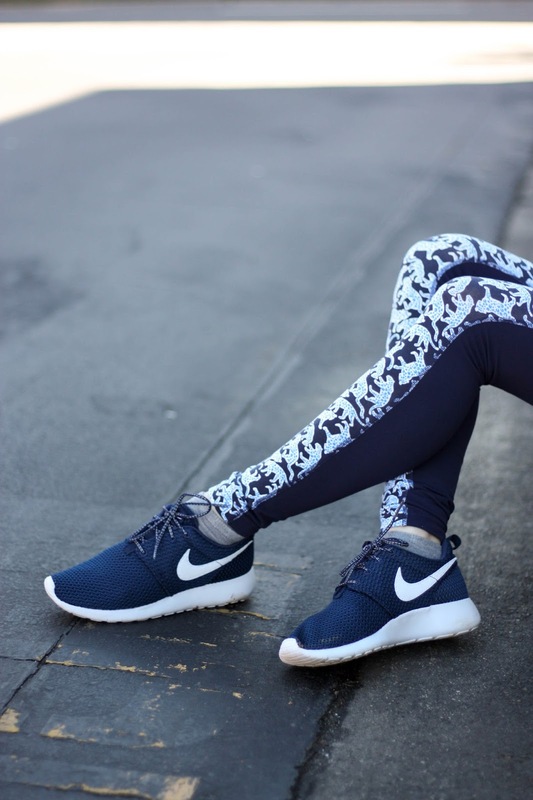 Plus, I've only seen the Roshe sneakers in taupe, but I'm loving the navy pair.